After walking around all the shops for the sales, why not treat your feet to some pampering! This week I have selected HealthCare4All’s top 3 Luxury products to help soothe painful, swollen, tired feet! I personally use the Beurer FB50 and every time I use it I am reminded why we sell so many. Pure luxury and bliss! Footner Exfoliating Socks are a revolutionary product to give you smooth, softer feet with just one 60 minute application. Footner Exfoliating Socks make use of the skin’s natural process to rid your feet from dead skin build-up. After just one application your feet will shed this dead skin. Feeling young and rejuvenated, your feet will be smoother than ever. Using this product helps the peeling of the hardened skin build-up on your feet. Footner Exfoliating Socks makes use of the skin’s natural peeling process to remove dead skin from the feet. Within 7 – 10 days* you will be left with soft, smooth, rejuvenated, baby-soft feet. I have purchased this a few times and I must say I am a big fan. There is something so satisfying about all of your skin falling off your feet. Yes it is so hideous and disgusting and you will leave skin everywhere but man alive it is amazing. It leaves your skin feeling soo smooth! I have a couple really hard bits of my feet which are not returned to super smooth skin after using this but it certainly takes a good few layers off and softens it. I just go at those bits with a pumice stone and my feet are left looking beautiful! Relaxing foot spa bath from Beurer that features a water heater with variable settings, an LCD display to allow easy adjustments, and vibration AND bubble massage. What more could you want from a foot spa? 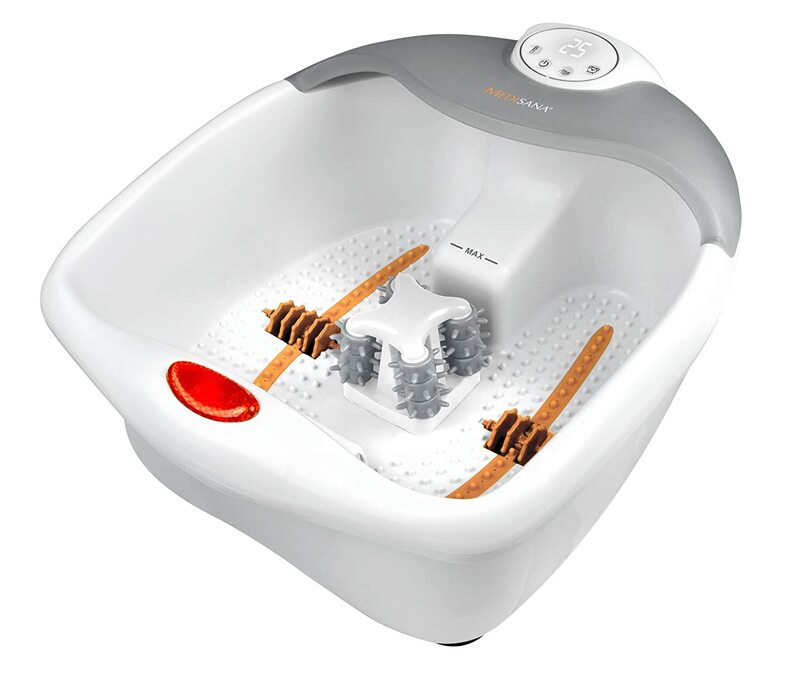 The footbath has four magnets and eight infrared lights integrated into the bath. They promote your circulation and stimulate the reflex zones. You can experience a special massage effect by moving your feet back and forth on the six massage rollers integrated into the bottom of the footbath. The massage rollers can optionally be removed by pulling them firmly upwards. Place the desired attachment on the holder in the centre. Press the attachment lightly down with your foot to activate the electric motor. 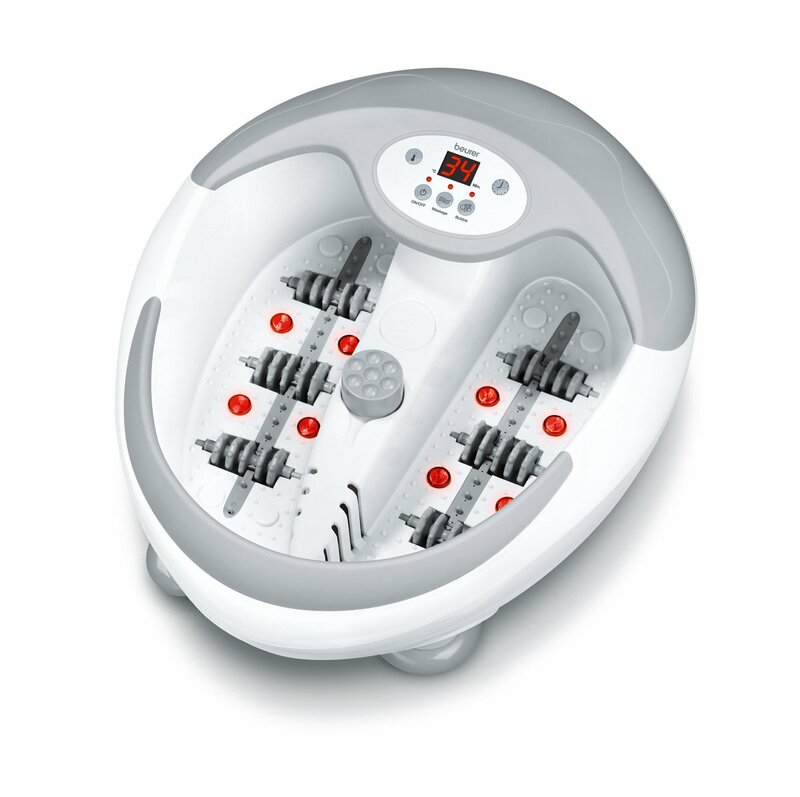 The massage attachment provides a soothing massage for your feet and promotes the circulation. The corn and callus remover is used to remove dead skin cells and calluses. This arrived the next day and i have to admit i was skeptical when my other half got it for me. Usually foot spas are too soft to do anything for my feet, because i have plantar faciatis. I was proven wrong when taking it out and gave it a go. The fact that the water is warmed and kept warmed long enough ( i do like a long foot soak and i usually sit with the hot kettle next to me to top up my bowl) was beyond expectations. Constant temperature was amazing. Then you add the vibrations and the bubbles and i was in heaven. Well impressed! Good piece of kit for tired and achy feet. As I mentioned earlier the Beurer FB50 is my absolute favourite, however I appreciate it is not cheap! So as an alternative our second best seller is the Medisasa FS885 Comfort spa. At £89.99 it is £16 cheaper and also an excellent product. Review for The Medisana FS885 Foot Spa.. This foot spa is absolutely great, haven’t had a foot treatment like this ever. So relaxing, water stays warm, bubbles are terrific and vibration really feels lovely, AND, you can use it without water for a dry massage, both are a brilliant experience.